• Fear of Miscarriage- This is another major fear that women over the age of 40 have. It’s true that miscarriages are more common in older women and almost 50% of all pregnancies in women of this age will end in a miscarriage. Once again, these women fear failure, disappointment and sadness, which prevent their pregnancy attempts. It’s understandable that miscarriages are extremely difficult to go through. Whenever a urine pregnancy test shows up positive, there is a lot of excitement that is tinged with worry too. • Fear of an Abnormal Pregnancy- In some cases, older women fear that they will have an abnormal pregnancy. They must have either been told by some “wise” women or may have also read on the Internet that the chances of an abnormal pregnancy increase with age. The possible abnormalities that can show in the screening test are being pregnant with a child that has Down's syndrome ; or other serious chromosomal problem that is incompatible with life. When I counsel women above 40 years of age who are either planning a first child or wanting to add another one to their family, I always tell them to list their fears and then discuss them with me when they come in for a consultation. I also feel that while you will have certain qualms and fears and we as doctors are more than willing to listen and help allay them, it’s also important to discuss and focus on the joy that comes from being pregnant and having a child. In many instances, the potential happiness truly does outweigh the fears that you may have. Today, there is technology which can help you conquer those fears. 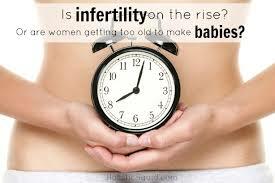 A lot of my patients are now considering IVF with PGS (Pre-Implantation Genetic Screening). Though this process is expensive, it does offer new hope. The only method we know of how to prevent the primary reason for miscarriage in an older woman, is to ensure that we transfer an embryo that is chromosomally normal. IVF/PGS is used to screen the embryos for all chromosomal information; couples can then choose to not transfer any of their abnormal embryos. I make it a point to share this information with my patients above 40 years of age and encourage them to give IVF with PGS a shot. For many of them, just this chance of having a healthy baby is more than the risk of a failure.